Sameer Baroova is co-founder of FitXR, a fitness technology company and creator of BOXVR, a top selling VR app on Oculus and Steam. 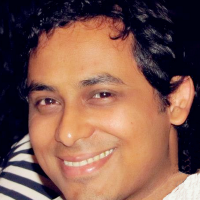 Prior to this, Sameer worked at PlayJam, EA and PopCap in various roles. The purpose of this talk is to share FitXR's insights from acquiring the first 10000 customers for their top selling app BOXVR. The talk focuses on lessons learnt from using traditional user acquisition methods such as search optimisations, ads, marketing campaigns, competitions, social media campaigns, store placements, influencers, reviews, in game features and community management. Sameer will discuss the success of each type of method and elaborate on how FitXR used the lessons learnt in improving their game design, and in increasing engagement and retention.